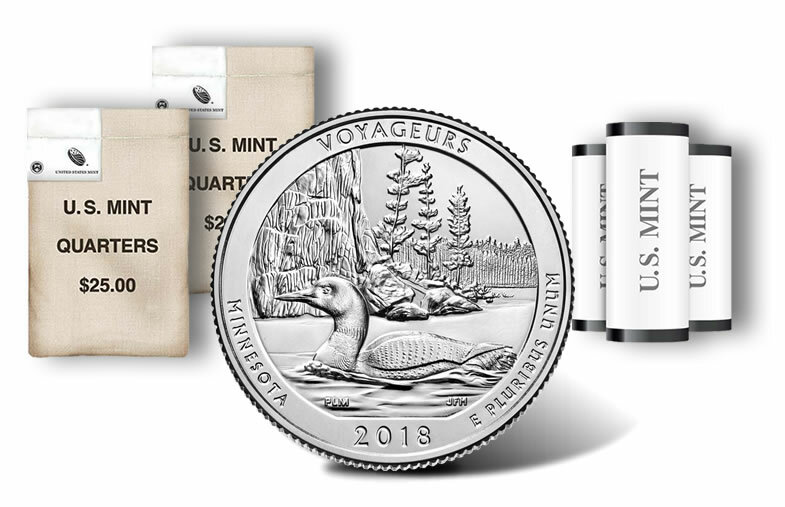 Available products include 40-coin rolls and 100-coin bags with options from which U.S. Mint facility produced the quarters. Voyageurs National Park was established on April 8, 1975 and is the only national park in the state of Minnesota. It is located in the northern portion of the state near the city of International Falls. One of the many factors making this park unique is that its main land portion is only accessible via watercraft in the summer or by crossing on ice in winter. 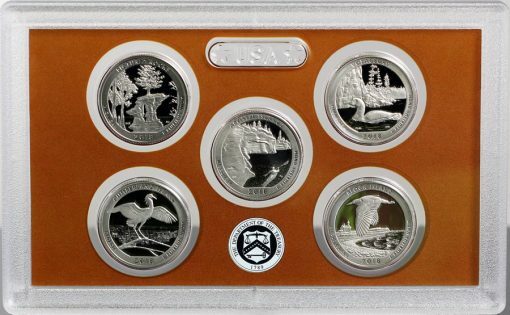 Flora, fauna and landscape of the national park are depicted on the new quarter dollar’s reverse (tails side). This image was selected from five design candidates. It centers on the likeness of a common loon as it swims along the lakeshore. Behind, we find a rock cliff and vegetation of the region. Inscriptions on the reverse read "VOYAGEURS," "MINNESOTA," "2018" and "E PLURIBUS UNUM." Minnesota’s Voyageurs National Park quarter depicts a common loon with a rock cliff and trees in the background. This quarter is the third of five for 2018. U.S. Mint AIP (Artistic Infusion Program) Designer Patricia Lucas-Morris designed the image with U.S. Mint Sculptor-Engraver Joseph Menna executing it for use on coinage. In the following U.S. Mint video, Menna talks briefly about his work on the quarter. Seen on the obverse (heads side) of each quarter is a left-facing portrait of the first President of the United States. The effigy of George Washington was originally designed by artist John Flanagan and has appeared on quarters, with some slight changes, since 1932. Inscriptions on the obverse read "UNITED STATES OF AMERICA," "LIBERTY," "IN GOD WE TRUST," and "QUARTER DOLLAR." In addition, the obverse bears the mintmark indicating which U.S. Mint facility produced the release — ‘P’ for Philadelphia, ‘D’ for Denver, and ‘S’ for San Francisco. Coins in these products are of circulation quality but have never actually been released into circulation. Also, of note, while Denver and Philadelphia routinely produce quarters that are actually issued for circulation, the San Francisco Mint only produces circulation quality coins such as these for numismatic purposes. The U.S. Mint’s online store, located here, offers rolls and bags of Voyageurs National Park quarters. They may also be ordered by calling the U.S. Mint at 1-800-USA-MINT (872-6468). For those in the area, the U.S. Mint will host an official release ceremony for the new coin. The event is scheduled for Thursday, June 14, 2018 from 11 a.m. to 12 p.m. (CT). It will be held at the Irv Anderson Amphitheater, 360 Hwy 11 East, International Falls, MN 56649. Attendees of the event are offered the opportunity to exchange cash for rolls of the new quarter. On the preceding night, Wednesday, June 13, 2018, from 5 p.m. to 6 p.m. (CT), there will be a coin forum. At the forum, guests will have the chance to ask questions of U.S. Mint officials. Location of the forum is Kabetogama Lake Town Hall, 9707 Gamma Road, Kabetogama, MN 56669. Once completed, the quarter’s program will have included a total of fifty-six new coins with one representing a site from each state, the District of Columbia and the five territories of the United States. The program debuted in 2010 and will run through 2021. In addition to the quarter dollars, the U.S. Mint also produces large three-inch, five ounce silver coins featuring the same designs. This includes bullion coins which are sold through the Mint’s network of authorized purchasers for small premiums above current melt value. It also includes five ounce silver uncirculated coins which are sold directly to the public. 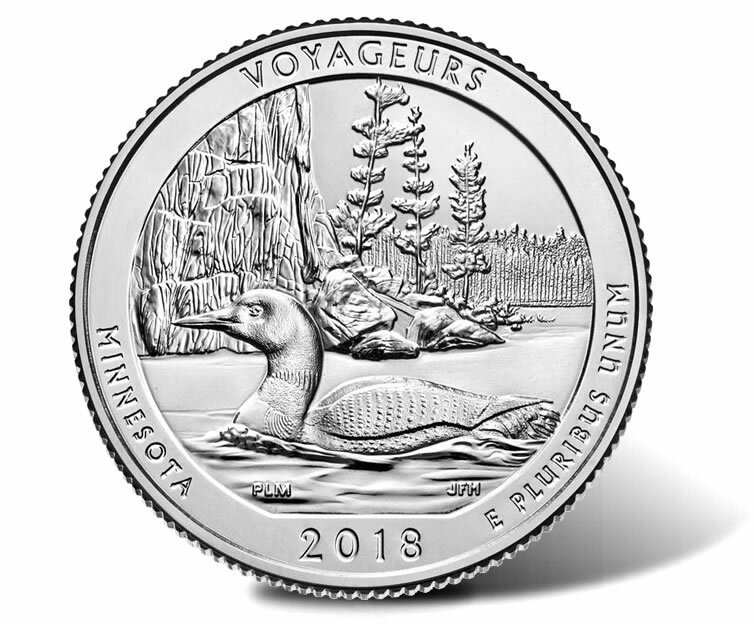 The Voyageurs National Park Five Ounce Silver Uncirculated Coin will be released later this week on Thursday, June 14. Pricing of the .999 fine silver collector coin is $154.95. Is it OK to order from overseas ?? The U.S. Mint does accept orders from Australia residents & ships to most other countries. The international shipping & handling fees are $17.90 (USD) plus $2.95 (USD) per item ordered. Good luck mate!